A squad of U.S. marines rides a 7-ton truck after being ambushed several times by insurgents while on a 'movement-to-contact mission in order to flush out insurgents operating in the Fallujah area south of Fallujah on Thursday, April 15, 2004 in Iraq. The marines are part of the 3rd Battalion, 4th marine regiment, which saw heavy combat at the beginning of the war last year, and is now back in Iraq embroiled in intense fighting with the resistance. 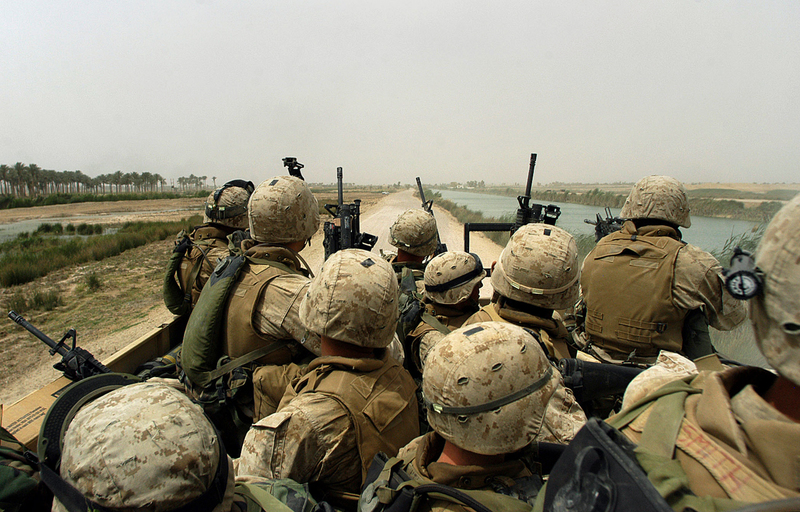 Today, the men of the 3rd Battalion were ambushed half a dozen times while they patrolled the palm groves and wheat fields around Fallujah, and the marines killed at least 10 insurgents, and suffered only minor injuries.